Doc Powell Norman Brown Paul Jackson jr.
"It's a Beautiful Day" is a CD that I hold close and dear to my heart as any parent would do with their first born child. I began writing music and laying down grooves for this CD in September of 2011. I would lay down drum tracks that I would hear in my head or that were created while using the drum software "Battery" which has great sounding drums. I laid tracks for a few months and began adding bass lines to a few of them as the drum tracks became better developed. My original plan was to complete the CD "It's a Beautiful Day" by January or February of 2012 but I became consumed doing other things in life, that I was unable to reach my release date of Jan/Feb. Musically things had to lay dormant until the end of June, which was when I was able to pickup where I left off in writing and laying tracks again. I remember working very long hours in the studio from the end June to the middle of July, It was very very hot in July of 2012. I was able to complete a large amount of music during this time and I then took a break for about two weeks and resumed writing in August. I got back to my intense schedule and completed the accompaniment foundation for all the tracks but one of the most important and significant parts of the music for all the songs wasn't created or even thought of at this time, which were the melodies and solos for each of the songs. I for no apparent reason wrote the melodies and created the solos last for this CD, which was very mentally and creatively challenging but fun at the same time. I had to make sure that each melody was engaging and a perfect marriage for all the tracks that had been laid over the months and weeks. The creation of the melodies and solos was a success, every melody fit perfectly in it's place all the solos flowed off my finger tips with the precision of Rembrandt. 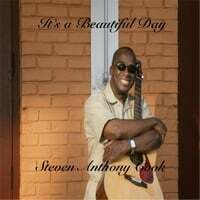 I mixed and mastered for the remainder of August and was able to release my first CD "It's a Beautiful Day" on September 1st. It was a great experience in meeting the challenges of writing, recording, mixing and mastering the music for my first CD. I think you as a listener will enjoy the melodies and soloing that float over funky accompaniment grooves of "It's a Beautiful Day". I look forward to hearing the thoughts as your mind takes a journey while relaxing and listening to my music.